Devilish Brain Training took rather a long time to create. Did that mean the long development period was relatively thin on work? No, it wasn’t ‘thin’… quite the opposite. From the perspective of the dev team, it was actually quite ‘fat’. With the original Brain Training1, we put out two titles in a short period of time. But the set-up is completely different now, and the central concept of this title was far from a simple one. 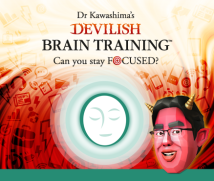 Today, I would like to ask about how you approached this title and how Devilish Brain Training came together. Thank you very much for joining me today.1 Dr. Kawashima’s Brain Training: How Old is Your Brain? : A title released for the Nintendo DS system in Europe in June 2006. A sequel, More Brain Training from Dr. Kawashima: How Old Is Your Brain?, was released in Europe in June 2007. Can I start by asking each of you to introduce yourselves? 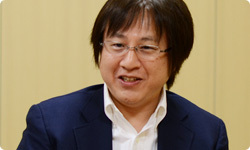 My name is Kawamoto, and I worked as a producer. You also came up with a large amount of the code for previous Brain Training titles as director. Did you write code this time, too? 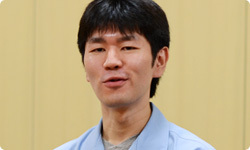 My name is Kitamura, and I worked as director. Of those of us here today, I’ve been involved with Devilish Brain Training the longest. My name is Ito, and I also worked as director. I joined this project partway through development as a programmer, but in addition to programming, I was responsible for all kinds of other things. How long has it been since you joined the project? That’s right. The software was originally used in university research, and involved a series of calculation problems appearing one after the other. It’s a type of training known as ‘n-back exercises’2, in which you have to answer the problem that appeared a certain number of times before. The project kicked off about three years ago when we got a request to port this over to Nintendo DS.2 N-back exercises: Exercises that require the player to provide the answer to a problem that was displayed a certain number of times earlier, where N is that number, rather than the answer to the problem currently displayed. ‘1-back’ requires players to provide the answer for the previously displayed problem, ‘2-back’ requires players to provide the answer for the problem displayed two times previously, and so on. So it wasn’t a game at first, but rather was for research. So that prototype software was the starting point. 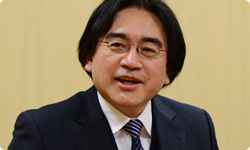 Dr. Kawashima then came up with concrete ideas for developing it, and it became a fully-fledged game proposal, right? Yes. I think it was just before the 2010 Winter Olympics in Vancouver. As I learned in my earlier discussion with Dr. Kawashima, when he conducted research with Olympic athletes using this Nintendo DS software, those athletes actually surprised everyone by achieving new personal bests. That’s right. At that time, we believed that solving repeated n-back exercises would actually improve working memory.33 Working memory: Refers to the memory process for temporarily holding, manipulating and using information. It is a brain function that checks goal-oriented memorised material against multiple pieces of stored information and responds appropriately. But at the same time, you sensed that this was not going to be an easy concept to work with. When you tried that prototype software, you said it was incredibly difficult. So even a Brain Training expert couldn’t handle it! (laughs) But looking back now, do you think that perhaps you were doing it for too long? Yes, I think that’s true, as we were testing it at the same time as we worked on it. But it wasn’t just that. As if it wasn’t exhausting enough to calculate the answer to the n-back exercises and remember previous answers, you also had to contend with a difficulty level that adjusted itself automatically. So as you improved, the game upped the difficulty. If you made mistakes, it would lower it. That was incredibly taxing. It keeps you operating right at your limits. Yes, it just wouldn’t give you a break! The prototype software really was a killer. You could say that it never allowed you to get to grips with it. We weren’t using the term at that point, but there truly was something ‘devilish’ about it. I thought it would be interesting to make it so the game didn’t just keep on getting more and more difficult. Instead, if the player had trouble, it would lower the difficulty to suit that player. Was the idea of having the difficulty adjust to the player one that you had since the early stages? Yes, it was included in the software from the beginning as a way to make the exercise more efficient. Yes, I suppose that makes sense from the training perspective. 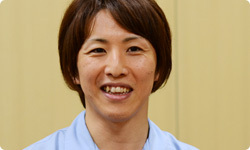 Then, after the Vancouver Olympics, you thought of various kinds of training based on n-back exercises with the goal of improving working memory, and suggested them to Dr. Kawashima. Yes. But at that time, I had moved over to the Nintendo 3DS team. Oh, that’s right. You moved to the Nintendo 3DS team to work on applications like StreetPass Mii Plaza and AR Games.44 StreetPass Mii Plaza and AR Games: Applications that come pre-loaded on Nintendo 3DS. StreetPass Mii Plaza is a place where Mii characters received through StreetPass meet and greet each other. You can see other Nintendo 3DS user profiles there and enjoy the StreetPass Quest game and other content. AR Games uses the Nintendo 3DS outer cameras to read augmented reality cards (AR Cards) to allow players to enjoy games that extend virtual elements into real space. Right. I passed the baton to Kitamura-san. 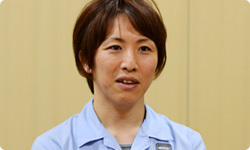 Kitamura-san, what did you think after first receiving the baton? It was such a difficult exercise that I thought the only way to sell it was by focusing on how tough it was! So you decided to make a virtue of its difficulty? Right. There are a certain number of people out there who get more enjoyment the more difficult something is, so I thought we would go all out to target those people. At that time, did you expect the development period to last as long as it did? Right. I thought we’d be able to put it together in three or four months and launch it for Nintendo DS! Well, it didn’t quite work out that way.